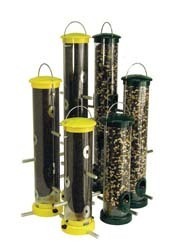 Available exclusively at Wild Birds Unlimited, our EcoClean™ feeders and accessories are the most advanced bird feeding products available on the market. EcoClean™ products feature a patented technology that inhibits the surface growth of damaging bacteria, mold and other microbes. This protection won’t wash or wear away, and it uses environmentally friendly technology. 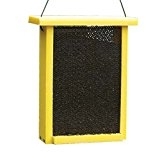 This feeder comes in EcoClean™ (black) and regular (yellow) small, medium and large depending on how many feeding ports you want. Lifetime Guarantee. Made of woven nylon netting, who would have thought a mesh bag would make such a fun finch feeder? Just add Nyjer® (thistle) and watch the finches fly! It's easy to hang, easy to fill and a real value. Add one or two to your yard today. (Birdfood not included.) These work really well as a window feeder. Just ask us about our window hooks! 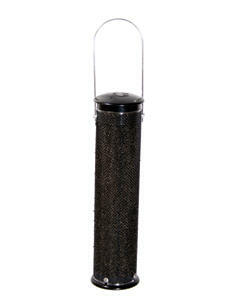 This mesh style finch feeder is made out of recycled materials making it easy to clean and long lasting. Fill it with Nyjer® or Finch Blend and watch the finches go nuts! 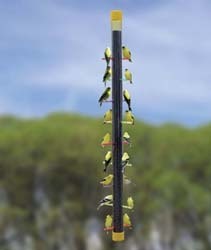 I recommend using Feeder Fresh™ with ALL Finch Feeders as finches are one of the pickiest birds around. Keep your feeder clean and your seed fresh. There's no fooling the finches with sub-par food. Feeder Fresh™ is non-toxic and made from sand, just very absorbent. The essential elements of Feeder Fresh™ are already consumed by wild birds and needed for their shell strength. It is actually safer than sand and one of the safest materials on Earth. 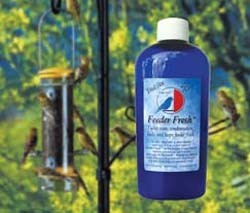 Feeder Fresh™ has been developed with bird safety in mind. They have done extensive literature research to show that the product is not harmful to birds, and will actually promote the health of wild birds. Feeder Fresh™ has been endorsed by Dr. Kirk Klasing, University of California Avian Physiologist. Birds recognize that the Feeder Fresh™ granules are not seed and when they encounter one, they just toss it aside. If they were to eat one, the particle would act the same as the sand that birds normally eat for their gizzard. Feeder Fresh™ does not swell or clump.